OFFICIAL RULES NO PURCHASE NECESSARY TO ENTER OR WIN. A PURCHASE WILL NOT INCREASE YOUR CHANCES OF WINNING. VOID IN ALASKA, FLORIDA, HAWAII, NEW YORK, RHODE ISLAND, AND WHERE PROHIBITED OR RESTRICTED BY LAW. 1. Eligibility: Sweepstakes is open to all legal residents of the forty eight (48) contiguous United States and the District of Columbia (excluding Florida, New York and Rhode Island) who are nineteen (19)years of age or older and have a valid email account at the time of entry. Employees of Southwest Airlines Co. (“Sponsor”), Disney Destinations, LLC (“Disney”) their advertising and promotions agencies, and their immediate families (spouse and parents, children and siblings and their spouses) and individuals living in the same households of such employees are ineligible. Eligibility is contingent on agreement to, and compliance with, these Official Rules and Sponsor’s decisions, which are final and binding in all matters related to the Sweepstakes. Winning a prize is contingent upon fulfilling all requirements set forth herein. Sweepstakes subject to all applicable federal, state, and local laws and regulations. This Sweepstakes is offered in the United States only and shall only be construed and evaluated according to United States law. Do not enter this Sweepstakes if you are not located in the United States. 2. To Enter: Sweepstakes starts on September 1, 2018 at 12:01 a.m. Central Time (“CT”) and ends on September 30, 2018 at 11:59 p.m. CT (“Sweepstakes Period”). To enter the Sweepstakes, participants must enter a valid email address via www.Southwest.com/TakeFlight . All entries become property of Sponsor and will not be acknowledged or returned. Incomplete entries are not eligible. Individuals who do not follow all of the instructions, provide the required information in their registration, and/or abide by these Official Rules or other instructions of Sponsor may be disqualified. Entries must be received by September 30, 2018 at 11:59 p.m. CT. Entries limited to one (1) per person. Sponsor’s computer is the official timekeeping device for this Sweepstakes. No photocopied, mechanically, or electronically reproduced entries accepted. Any attempt by any person found to enter or in any way attempt to obtain more than the authorized number of entries will be found to be ineligible, and their entries will be disqualified. Any eligible individual participating in this Sweepstakes shall be a “Participant.” Participation must be by the Participant. Multiple entrants are not permitted to share the same email account. In the event of a dispute as to the identity of a Participant, the authorized account holder of the email account used to enter the Sweepstakes will be deemed to be the Participant. “Authorized Account Holder” is defined as the natural person who is assigned an account by the organization which is responsible for assigning such accounts or the account associated with the submitted email address. Potential winners may be required to show proof of being the authorized email account holder. If the identity of the individual who actually participated in the Sweepstakes cannot be resolved to Sponsor’s satisfaction, the affected individual’s entry will be deemed ineligible. 3. Drawing: On or about October 8, 2018, a random drawing from all eligible entries received will be conducted by Sponsor. Winner will be notified by phone and/or email on or about 72 hours after the random drawing takes place. Odds of winning will depend on the total number of eligible entries received. Participants need not be present to win. All potential winners are subject to eligibility verification by Sponsor, whose decisions are final and binding. A PARTICIPANT IS NOT A WINNER OF ANY PRIZE, EVEN IF NOTIFIED OF BEING A WINNER, UNLESS AND UNTIL THE PARTICIPANT’S ELIGIBILITY HAS BEEN VERIFIED. 4. 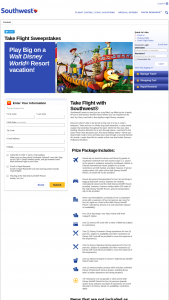 Prize : One (1) Southwest Airlines Take Flight Flyaway package. Approximate retail value (“ARV”) of prize is $ 6,579. ARV is as of the date of printing these Official Rules. The difference in value of prize a stated herein and value at tie of prize notification, if any, will not be awarded. · Round-trip air travel for winner and three (3) guests on Southwest Airlines® from the closest major U.S. airport to the winner’s residence served by Southwest Airlines to Orlando International Airport (subject to air travel restrictions set forth below); provided, however, if winner resides within 250 miles of the Walt Disney World® Resort, air travel will not be provided. · Round-trip ground transportation for four (4) via Disney’s Magical Express® service between the Orlando International Airport and theWalt Disney World® Resor t; provided, however, if winner resides within 250 miles of the Walt Disney World® Resort, ground transportation will not be provided). · Room accommodations consisting of one (1) standard room with a maximum of four (4) persons per room) for four (4) nights at a hotel at the Walt Disney World® Resort selected by Disney in its sole discretion (based on availability). · Four (4) 5-day Magic Your Way Tickets with Park Hopper® Option. · One (1) Disney Gift Card with a value of $500.00 (subject to restrictions). · One (1) Disney Character Dining experience for four (4) persons, subject to availability and other restrictions (a Disney Gift Card will be provided to cover the expense of this experience). · One (1) Disney Signature Dining experience for four (4) persons, subject to availability and other restrictions (a Disney Gift Card will be provided to cover the expense of this experience). · One (1) Welcome Basket in winner’s Walt Disney World® Resort hotel room. · One (1) Memory Maker product which includes unlimited Disney PhotoPass® Service photos, including those taken at select attractions and dining locations. · VIP viewing for one (1) parade or show at the Walt Disney World® Resort for four (4) persons (parade and/or show selection and date of experience are at the discretion of Disney; based on availability; restrictions apply). Vacation package must be taken by September, 2019 and the winner of the Sweepstakes and his/her guests must travel together on the same itinerary. Vacation package is for the winner of the Sweepstakes and up to three (3) guests of the winner’s choosing. The Vacation Package must be booked through a travel agent as designated by Disney at least forty-five (45) days prior to arrival. Departure date and accommodations are subject to availability; certain restrictions and blockout dates may apply. Advance reservations required. All elements of the vacation package (including, without limitation, the theme park tickets) must be used by the winner and his/her guests at the same time during the redemption of the vacation package. If any winner chooses to bring less than the allotted number of guests, the vacation package will be awarded in increments suitable for the actual number of participants with no substitute prize or compensation provided to the winner. Any lost or stolen theme park tickets, gift cards, or travel vouchers will not be replaced. Gift Cards are not redeemable or exchangeable for cash (except as required by law) and are subject to all terms and conditions of use as established by issuer. Vacation package and vacation package components (including, without limitation, theme park tickets) may not be sold, redeemed for cash, traded, transferred, rescheduled to dates not within the fulfillment period set forth above, used in conjunction with any other promotion or offer or refunded. Vacation package is not redeemable for cash. Vacation package components may not be separated. Any unused portion(s) of the vacation package will be forfeited. Theme park attractions and entertainment are seasonal and subject to change without notice. Prize must be accepted as awarded or prize will be forfeited and awarded to an alternate winner. Travel accommodations and other restrictions apply. All costs and expenses associated with prize acceptance and use not specified herein as being provided, including but not limited to lodging, transportation costs, meals, gratuities and other expenses incurred by accepting the prize, are the sole responsibility of the winner. No prize substitutions, cash equivalent, or transfer of prizes permitted except at the sole discretion of the Sponsor. Sponsor reserves the right, at its sole discretion, to award a prize of greater or equal value if the advertised prize is unavailable. Air Travel Restrictions : Air travel is subject to Southwest Airlines terms and conditions; certain restrictions may apply. Round trip travel for four (4) on Southwest Airlines will be awarded in the form of eight (8) Southwest flight e-passes. Each Southwest flight e-pass is valid for one-way travel on Southwest Airlines-operated, published, scheduled service in the United States and Puerto Rico. The Southwest flight e-pass will bear the date of issue and the date of expiration. Expiration dates will not be extended, and travel must be completed on or before the expiration date. The Southwest flight e-pass is not valid on interline or codeshare service. The Southwest flight e-pass is non-refundable and is not redeemable for cash or credit. The Southwest flight e-pass will not be replaced for any reason, including, without limitation, if lost, stolen, or fraudulently used. The Southwest flight e-pass is non-transferrable and cannot be sold to a third party. Sale, auction, or re-tendering of the Southwest flight e-pass for money or otherwise is strictly prohibited. The Southwest flight e-pass may not be used for promotional purposes unless previously approved by Southwest Airlines. Any suspected fraud, misrepresentation, misuse, abuse or violation of the Southwest flight e-pass rules and regulations may result in cancellation of the Southwest flight e-pass(es). Southwest flight e-pass holders are required to be nineteen (19) years of age or older and a legal U.S. resident. However, the recipient of a Southwest flight e-pass may arrange travel for another person if done without selling or bartering a Southwest flight e-pass. Air transportation by Southwest Airlines is subject to Southwest Airlines’ Passenger Contract of Carriage set out at www.southwest.com/contractofcarriage . If the winner does not live in a city served by Southwest Airlines, he/she is responsible for transportation to and from the nearest airport served by Southwest Airlines. Winner is responsible for booking all travel and paying all applicable international taxes and fees. Travel is based on seat availability. Seats on any desired flight are not guaranteed. Winner and guest(s) must travel on the same itinerary and are responsible for obtaining all required travel documents. Winner and guest must have valid government-issued photo identification at the time of travel. If the travel guest is a minor, winner must be his/her parent/guardian, or be accompanied by his/her parent/guardian. 5. To Claim Prize: Winner will be notified by phone and/or email and will be required to complete and sign an Affidavit of Eligibility and Liability Release and, where legal, a Publicity Release (collectively, the “Required Documentation”). The Required Documentation will be mailed or emailed, based on the potential winner’s preference upon account validation. If a potential winner cannot be contacted using the information provided or fails to respond to Sponsor’s attempt to notify them of selection within three (3) days; if any notification is returned as undeliverable or yields an error of undeliverable type “bounce back” email (regardless if the message is ultimately delivered to the recipient); if Sponsor is unable to verify potential winner’s eligibility; if potential winner fails to sign and return the Required Documentation within the required time period or fails to comply with these Official Rules; if any prize is returned undeliverable; if a potential winner is unable or unwilling to accept the prize as stated; or if the potential winner cannot be verified as eligible for any other reason, the potential winner is disqualified and an alternate winner will be selected by random drawing from among the eligible entries. In the event that a potential winner is disqualified for any reason, the next received and eligible entry received by Sponsor that is fully compliant with these Official Rules shall be deemed the winner, until the prize is awarded or until two (2) attempts have been made to award the prize and each attempt has failed. Sponsor will identify each potential winner and verify the potential winner’s eligibility after the end of the Sweepstakes Period. If unable to verify eligibility, Sponsor will select an alternate potential winner within a reasonable time thereafter. If applicable, winner’s guest must execute a Liability Release and, where legal, Publicity Release, prior to the issuance of travel documents. If a guest is under eighteen (18) years of age, a parent or a legal guardian must sign on behalf of such guest and accompany such minor guest. 7. Indemnification; Limitation of Liability: NEITHER SPONSOR, DISNEY, NOR THEIR SUBSIDIARIES AND AFFILIATED ENTITIES ARE RESPONSIBLE FOR PRINTING OR TYPOGRAPHICAL ERRORS IN ANY SWEEPSTAKES-RELATED MATERIALS OR TRANSACTIONS THAT ARE PROCESSED LATE OR INCORRECTLY OR ARE LOST DUE TO COMPUTER OR ELECTRONIC MALFUNCTION. THIS SWEEPSTAKES OFFER IS BEING MADE EXCLUSIVELY BY THE SPONSOR. SPONSOR AND DISNEY ARE NOT RESPONSIBLE FOR TECHNICAL, HARDWARE, SOFTWARE, OR TELEPHONE FAILURE OF ANY KIND, LOST OR UNAVAILABLE NETWORK CONNECTIONS OR FRAUD, INCOMPLETE, GARBLED, OR DELAYED COMPUTER TRANSMISSION WHETHER CAUSED BY SPONSOR, USER, OR BY ANY OF THE EQUIPMENT OR PROGRAMMING ASSOCIATED WITH OR UTILIZED IN THE SWEEPSTAKES, OR BY ANY TECHNICAL OR HUMAN ERROR WHICH MAY OCCUR IN THE PROCESS OF SUBMISSIONS WHICH MAY LIMIT A PARTICIPANT’S ABILITY TO PARTICIPATE IN THIS SWEEPSTAKES. SPONSOR, DISNEY, AND THEIR RESPECTIVE PARENT S SUBSIDIARIES, AFFILIATES, AND EACH OF THEIR RESPECTIVE DIRECTORS, OFFICERS, EMPLOYEES AND AGENTS AND ASSIGNS, AND ANY AND ALL OTHER COMPANIES ASSOCIATED WITH THIS SWEEPSTAKES (COLLECTIVELY, THE “RELEASED PARTIES”) ARE NOT RESPONSIBLE FOR ANY DAMAGES OR INJURY INCURRED BY WINNER AND GUESTS AS A RESULT OF WINNING. BY ENTERING, PARTICIPANTS AGREE TO RELEASE, HOLD HARMLESS, DEFEND AND INDEMNIFY EACH OF THE RELEASED PARTIES AGAINST ANY AND ALL LIABILITY, DAMAGES, OR CAUSES OR ACTION (HOWEVER NAMED OR DESCRIBED), RELATED TO OR ARISING OUT OF (I) THE SWEEPSTAKES, (II) PARTICIPANT’S PARTICIPATION IN THE SWEEPSTAKES, AND (III) THE RECEIPT OR USE OR MISUSE OF THE PRIZE AND OR ANY PRIZE RELATED ACTIVITY AWARDED HEREIN AND TRAVEL REDEEMED HEREWITH. POSSIBLE CLAIMS OR CAUSES OF ACTION INCLUDE, BUT ARE NOT LIMITED TO, INFRINGEMENT OF ANY RIGHT OF PUBLICITY OR INTELLECTUAL PROPERTY; THREATENED OR ACTUAL INJURY, LOSS, OR DAMAGE TO ANY PERSON, INCLUDING DEATH AND DISABILITY; DEFAMATION OR PORTRAYAL IN A FALSE LIGHT (INTENTIONAL AND UNINTENTIONAL); AND DAMAGE TO OR LOSS OF PROPERTY, ARISING OUT OF SUCH PARTICIPANT’S PARTICIPATION IN THE SWEEPSTAKES OR RECEIPT OR USE OR MISUSE OF ANY PRIZE OR PRIZE RELATED ACTIVITY. IN NO EVENT WILL THE RELEASED PARTIES BE RESPONSIBLE FOR OR LIABLE FOR ANY DAMAGES OR LOSSES OF ANY KIND, INCLUDIN G, WITHOUT LIMITATION, INDIRECT, INCIDENTAL, CONSEQUENTIAL, OR PUNITIVE DAMAGES ARISING OUT OF THIS SWEEPSTAKES. If for any reason a Participant’s entry is confirmed to have been voided or corrupted by any grossly negligent act of the Sponsor, Participant’s sole remedy is another entry in the Sweepstakes, subject to availability and provided that the Sweepstakes has not then expired. 8. Construction and Disputes: Participants waive any right to claim ambiguity in these Official Rules. All issues and questions concerning the construction, validity, interpretation and enforceability of these Official Rules, or the rights and obligations of any participant and Sponsor in connection with the Sweepstakes, shall be resolved individually, without resort to any form of class action. The invalidity or unenforceability of any provision of thes e Official Rules shall not affect the validity or enforceability of any other provision. In the event that any such provision is determined to be invalid or otherwise unenforceable, these Official Rules shall be construed in accordance with their terms as if the invalid or unenforceable provision was not contained therein. Any and all claims, judgments, and awards shall be limited to actual out-of-pocket costs incurred, including associated with entering this Sweepstakes, but in no event attorneys’ fees. Sponsor reserves the right to correct clerical or typographical errors in Sweepstakes materials or these Official Rules. Sponsor’s failure to enforce any term of these Official Rules shall not constitute a waiver of that provision. All issues and questions concerning the construction, validity, interpretation and enforceability of these Official Rules, or the rights and obligations of any participant vis-à-vis Sponsor in connection with the Sweepstakes will be exclusively governed by, and construed in accordance with the laws of State of Texas, without giving effect to any choice of law or conflict of law rules or provisions (whether the State of Texas, or any other jurisdiction) that would cause the application of the laws of any jurisdiction other than the State of Texas. All issues and questions concerning the rights and obligations of any participant vis-à-vis Disney in connection with the Sweepstakes will be exclusively governed by, and construed in accordance with, the laws of the State of Florida, without giving effect to any choice of law or conflict of law rules or provisions (whether of the State of Florida, or any other jurisdiction) that would cause the application of the laws of any jurisdiction other than the State of Florida). THE EXCLUSIVE JURIDICTION FOR ANY DISPUTE ARISING OUT OF OR CONNECTED WITH THE ADMINISTRATION OF THIS SWEEPSTAKES (EXCLUDING ANY DISPUTE ARISING OUT OF OR CONNECTED WITH ANY PRIZE AWARDED (OTHER THAN AIR TRAVEL)) SHALL BE IN THE FEDERAL OR STATE COURTS LOCATED IN DALLAS COUNTY, TEXAS. THE EXCLUSIVE JURISDICTION FOR ANY DISPUTE ARISING OUT OF OR CONNECTED WITH ANY PRIZE AWARDED (OTHER THAN AIR TRAVEL) SHALL BE IN THE FEDERAL OR STATE COURTS LOCATED IN ORANGE COUNTY, FLORIDA. 10. Official Rules and Winner’s List: Official Rules and Winner’s List may be obtained by sending a request and self-addressed, stamped envelope to Sponsor, or by visiting Sponsor’s website. 11. Sponsor: Southwest Airlines Co., 2702 Love Field Dr., HDQ 1PR, Dallas, TX 75235. 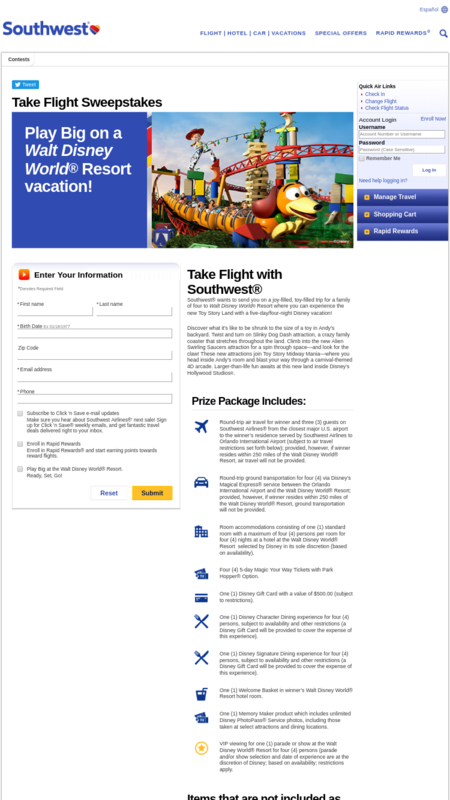 Southwest - Take Flight With Southwest Sweepstakes Win Free Stuff Win One Southwest Airlines Take Flight Flyaway package.